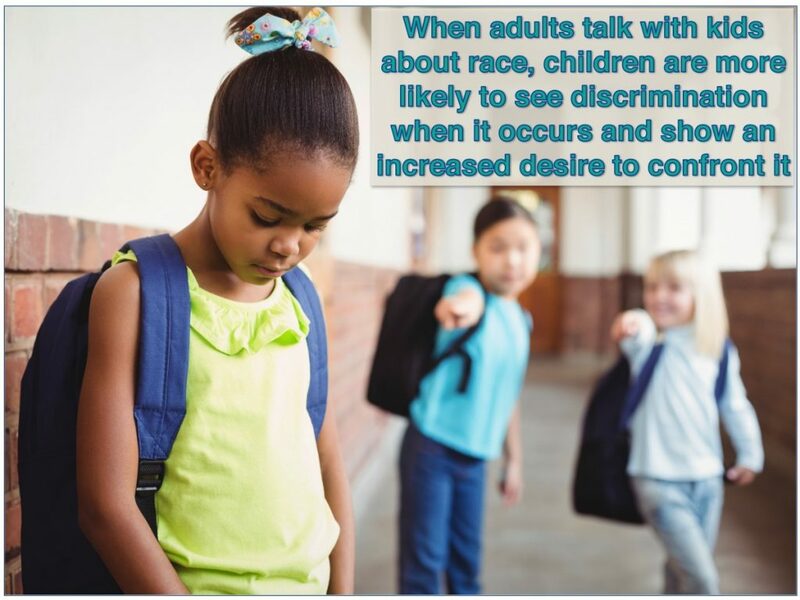 Research shows that when adults talk with kids about race and ethnicity, children are more likely to see discrimination when it occurs. Children also show an increased desire to confront it. Talking to children about race also helps them to make sense of racial injustices. Whether they learn about discrimination in history class or experience it on the playground, our children are trying to give some meaning to these events. In one study, teachers taught children about race in school. There were two main results. The first was that learning about race increased positive self-esteem. Second, children displayed a more positive racial identity toward their own racial group and other racial groups. This happens between peers as well. In another study, researchers measured the racial attitudes of 3rd- and 4th-grade children. Then they paired up children so that children who scored high on racial bias were matched with peers who scored low on racial bias. In pairs, children discussed topics related to racial bias and exclusion. At the end, the children again filled out measures of racial beliefs and attitudes. The results showed that talking about race decreased bias between groups. It also increased group tolerance, particularly for children who had initially scored high on racial bias.